You must be a member of the Vienna Jazz Music Concerts Group to attend this activity. Would you like to join this group? SHAKE STEW is Austria‘s jazz band of the hour. After playing more than 25 gigs during the first months since premiering at Jazzfestival Saalfelden Protected content selling out their first record „The Golden Fang“ within half a year, the unique septet is conquering the music world with a hypnotic mixture of afrobeat and jazz grooves shaken up by the intense and mysterious soundscapes created with a combination of two drummers and two double bass players! 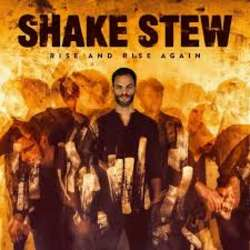 With „Rise And Rise Again“ Shake Stew are releasing their highly anticipated second album in May Protected content , which also features Shabaka Hutchings on 2 of the tracks. Everywhere they went so far, the press has been more than enthusiastic, often trying to create new terms and genre-labels to put their live experiences into words and this new release will only further establish their status as one of Europe's most upcoming Jazzbands. Shake Stew brings together seven unconventional musicians, all of them interesting characters of the young Austrian and German jazz scene. They are united with bandleader Kranzelbinder Protected content the pursuit of new, enhanced sound possibilities and by concepts beyond boundaries of genre, which are by now already considered a guarantee with Kranzelbinder. His own distinct combination of virtuosity, entertainment and uncompromising energy comes out in many of his projects and has meanwhile become a kind of trademark of the hard working musician, composer, and arranger. As the youngest musician so far in the history of the prestigious Jazzfestival Saalfelden, he was chosen to put together a new project for the festivals opening concert in Protected content , which is also connected with a 4 day residency. He put together a septet and prepared the festival show for a whole year, before not only recording the debut album “The Golden Fang” within a day of the residency but also playing a concert to remember: Der Standard from Vienna describes the septet’s performance as a „magical opening hour“, to the Kurier Shake Stew sounds „like an intergalactic road movie for the ears.“ The Süddeutsche Zeitung calls the bassist and composer Kranzelbinder a whizz kid and the OÖN added: „The 28-year-old writes fantastic pieces, which optimally feature the exciting instrumentation with its three-part horn section and two basses and drummers“.